In Joomla!, submenus can be shown either as one menu with two or more levels or as completely separate menu modules. To show how to do this, we will step through creating a two-level menu and then see how to show it either as one large menu or as separate parent and child menus. To create this structure, we create one menu with two levels of Menu Items. Note that we do this whether we want to have everything shown as one large menu or whether we want to create separate menu modules (one parent menu and two child menus). We'll see how to do this later on, when we create the modules. Here are the steps to create the Menu and Menu Items. Create a new Menu in the Menu Manager called "Pets". Add a new Menu Item called "Dogs". For this example, we don't really care what the type of the Menu Items is. For example, you can just create one article called "Pet Menu Test" and then create all of the Menu Items as type Article → Article Layout and point to this article. Add the "Cats" Menu Item. Be sure to make the Parent Item for this "Top". Add the last two Menu Items, "Tabbies" and "Siamese", making "Cats" the Parent Item for both. At this point, we've got the Menu and Menu Items done. Now we need to create the Menu Modules. In Joomla!, the Menu Module determines three main things: (1) what the menu looks like; (2) where on the page it will show; and (3) on which pages it will show. We will do two examples. In the first example, we will create one Menu Module that shows all of the items in one menu. In the second, we will create three separate menu modules to show the Pets, Dogs, and Cats menus as separate modules. Navigate to Extensions → Module Manager, click the "New" icon in the toolbar, and select "Menu". Enter the Title as "Pets Menu" and Position as "left". In the Menu Assignment, enter "Select Menu Item(s) from the List" and select "Home" (under "mainmenu"), and all of the Menu Items under the "pets-menu". 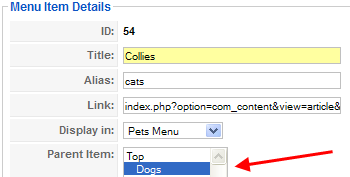 In Menu Name, select "pets-menu" from the drop-down list box. If you are using the default "rhuk_milkyway" template and want the menu to look like the other menus, in the Advanced Parameters enter "_menu" for Module Class Suffix. Notice that the Breadcrumbs now shows three levels: Home, Dogs, Collies. Because we used submenus, Joomla! "knows" that Collies is under Dogs. Now we will change our example to create three separate menus -- one for the top level (Dogs and Cats), one for the Dogs (Collies and Greyhounds), and one for the Cats (Tabbies and Siamese). Note: Make sure that your Menu Items each have a unique Alias value. If you use the Copy command in the toolbar of the Menu Item Manager to create these Menu Items, the Alias will be the same as the item being copied. In this case, just edit the Alias value to make it unique (for example, the same as the Title). If you have duplicate Alias values, the menus will not work correctly if the parameter SEF URLs is set to Yes in Global Configuration. 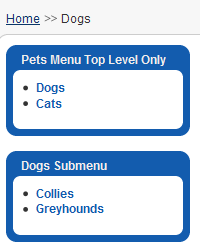 Open the Pets Menu in the Module Manager and change the Title to "Pets Menu Top Level Only". Under Module Parameters, select the Menu Name "Pets Menu"
Under Module Parameters, change the Menu Style to "List". Set the Start Level to "0" and the End Level to "1". This is optional. It allows your template to apply special a menu style to the menu (a border, for example). In Advanced Module Parameters put "_menu" in Module Class Suffix. For submenu Dog, in extensions menu select Module Manager, click New and select Menu, and set the title to "Dogs Submenu". Set the Position to "Left". 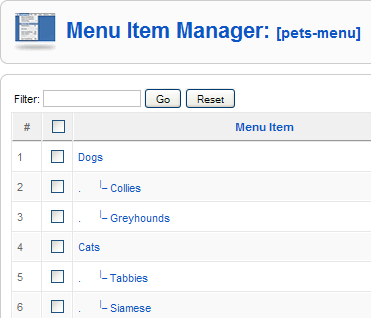 Under Module Parameters, select the menu name "Pets Menu" and change the Menu Style to "List". Set the Start Level to "1" and End Level "2". This is optional. In Advanced Module Parameters, set Module Class Suffix to "_menu". For the "Cats Submenu", repeat steps from 7 to 12 except step 9. In the Menu Assignment box, select the items "Cat", "Tabbies" and "Siamese" (so this menu will only show under these Menu Items). At this point, we have three menu modules all pointing to the Pets Menu. The only differences between them are (1) the Start and End Levels and (2) the Menu Item Assignment. 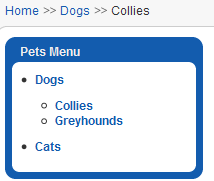 Click on the Collies Menu Item and notice that again the Breadcrumbs shows the hierarchy of "Home", "Dogs", and "Collies". Using this same technique, it is easy to create third-level submenus. You just make the Parent Menu Item a second-level submenu. Then you could use the same technique to create a separate Menu Module with Start Level of 2 and End Level of 3. This would show only the third-level Menu Items. This page was last modified on 1 April 2016, at 07:11.